The Bhatt camp is famous for their love stories – be it Aashiqui 2, Woh Lamhe, Gangster – with Mohit Suri trying to give us a heart touching love story with each of his movie. 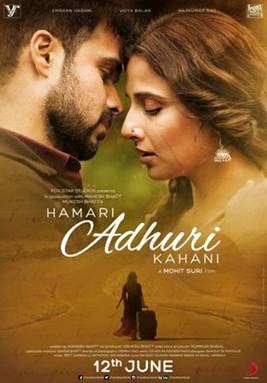 This time he brings us the love story of two star crossed lovers in Hamari Adhuri Kahani. Aarav Ruparel (Emraan Hashmi) is a business tycoon with over a 100 hotels under his management. Though hardly staying at one place for a long time, he does have a liking for white lilies around him. It’s because of this that he meets Vasudha (Vidya Balan) who works at one of his hotels. Vasudha is a single mom working to make ends meet and before you know Aarav starts falling for her. But she has a past; her past being her abusive husband Hari (Rajkumar Rao) who suddenly left her and disappeared one day. While Aarav tries to convince her that she deserves a second chance, Vasudha tries to cling to her memories of her husband who turns up in her life once again threatening to tear her life apart. The story of the movie gives ample opportunity to the writers to give some beautiful heart wrenching emotional moments to the audience but sadly fails miserably. What could have been a wonderful movie is spoiled entirely by two things – the screenplay by Mahesh Bhatt and the dialogues by Shagufta Rafig. The over melodramatic dialogues seem straight out of a 90’s movie and while that might have worked earlier, the audience of today would definitely not lap it up. Romantic dramas are nothing without emotions and these needn’t be portrayed every time with a dialogue. There are scenes where glimpses, facial expressions would have spoken volumes but sadly are spoilt by the twisted unrealistic dialogues. It’s a pity that in spite of having such wonderful actors, director Mohit Suri makes his leads do all the emoting with only words. The story itself is full of many clichés, Vasudha’s scenes with her mangalsutra seem to be straight out of Ekta Kapoor serials. Sure there are some scenes which you will take back – especially the one at the end – but you can’t help but wonder what some crisp writing could have done to this movie. The movie no doubt looks gorgeous and is somewhat salvaged by the performances and the music. Like all Bhatt movies, the music of this movie is beautiful and soulful and it’s difficult to pick a favorite from the album. The three main characters, give a lovely performance in spite of being bogged down by a flimsy screenplay and average dialogues. Vidya Balan needs no introduction and we know her eyes can convey a thousand words. We just wish we had got to see more of that in the movie. I always thought of Emraan Hashmi being an underrated actor and am always glad to see him pick up good character roles like in The Dirty Picture, Shanghai, etc. While he gets a pretty one dimensional character sketch, Emraan still gives us a performance which reminds us that he is so much more than the ‘serial-kisser’. Rajkumar Rao as usual is amazing and with probably the only character more believable in flesh, he makes an impact with his supporting act. Quite a few women face domestic violence and abuse in our country and what could have been a believable movie reflecting our times, turns out to be an average fair because of the script. A one-time watch for romance lovers.